Little more than a month away until the bees arrive! The above picture is from the class I took last summer, and I soon hope to have a hive filled with happy honey making bees. I watched Bees: Tales from the Hive: Nova (2000) via Netflix last night. I got into a little trouble because I did not tell my wife I was taking up a valuable space in our Netflix queue with this DVD, but luckily it is only 54 minutes long, and I was able to watch and return it in a day. It is a good documentary as it explores the inner workings of the hive and the entire bee life cycle. It is not an educational video on how to become a beekeeper, but simply takes you through an entire 4 seasons of a beehive. The camerawork is amazing, and I still wonder how they got some of the shots inside the hive. It also appeared to be shot somewhere in Europe and the type of hive they showed was not the usual Langstroth hive as it opened from the side and not the top. 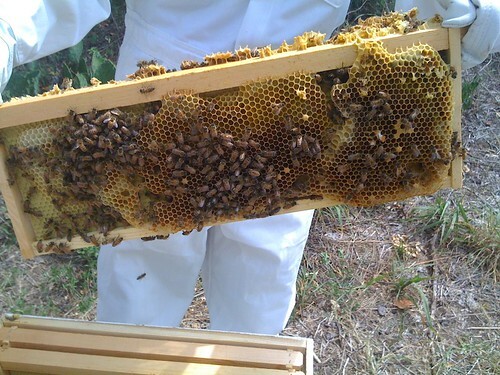 I’m going to do some research to see if I can find anything about this hive setup. Bees are incredible creatures able to fly miles in search of good food sources, but I never realized how efficient they were until my wife told me about a story she heard on NPR this morning. According to research done on a bee’s ability to convert honey into energy, a bee actually gets 4,704,280 miles per gallon of honey. To put that into perspective, the average distance from the earth to the moon is around 240,000 miles. 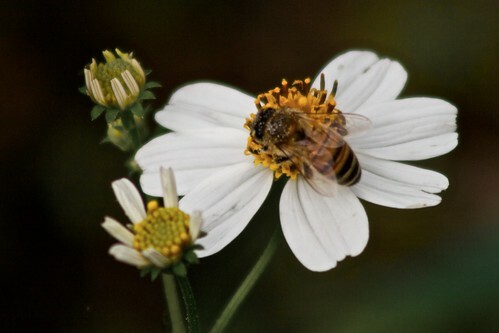 A single bee will only make 1/12 of a teaspoon of honey in its lifetime. Hey girls! It’s the nice man who gave us this nice home to live in! Leave that guy alone! Hey girls! It’s that mean man who steals all our honey! Get him! In my entire 35 years of life, I have yet to be stung by a bee, wasp, hornet, yellow jacket, etc. I did have a nasty run in with fire ants at an early age even after my mother warned me not to poke at the pile (I did anyway for the first and last time), but so far, no flying insect stings. I don’t think there is a single beekeeper in the history of the world that has never been stung so I know it is not a matter of if but when. I think the anticipation of that fateful day will end up being worse than the actual sting itself. As I beekeeper, I guess I need to add getting stung to the list that includes death and taxes as the only sure things in life.